My famous (infamous?) 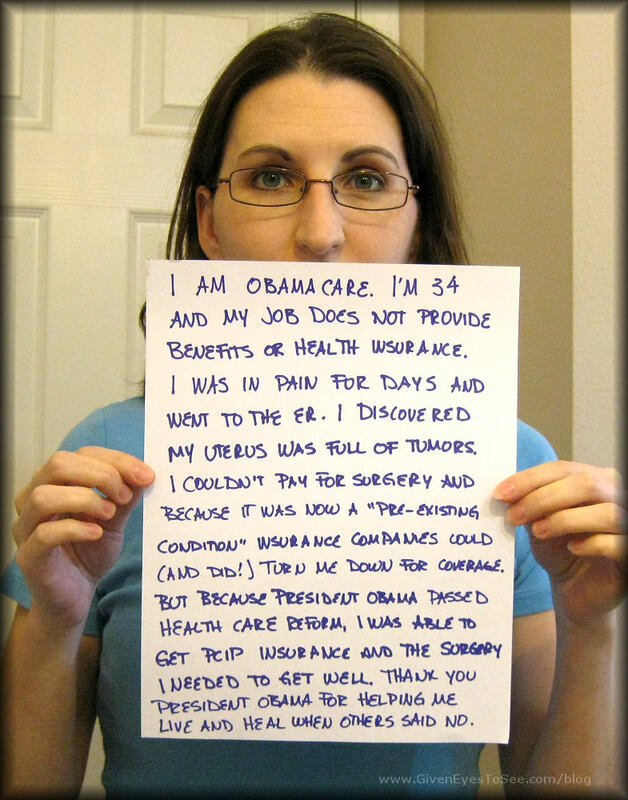 I am Obamacare image is going around Facebook again. Thousands of comments have been left and sadly, almost a year later, the vast majority of people are still utterly incorrect in their beliefs about what it is, who I am, and what it’s all about. They utterly and completely are working from total lies told by the opposition and are often hateful, spiteful and downright angry about it all. I don’t know that the truth and actual facts will change their minds – or if they’ll even listen! – but here are some basics. First off, who’s the woman in the picture? Me. I’m M. Turner. I’m 35 now (though I was 34 when I took and posted the picture last year) and I live with my fiancee and two cats in an apartment in the Tampa Bay Area of Florida. 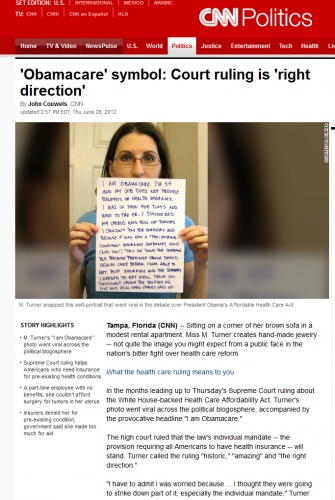 The original “I am Obamacare” image I took and posted October 2011. Did someone pay me to take the picture/am I a political operative?/Is the picture real? No one paid me. I don’t work for any party or any political group of any kind. 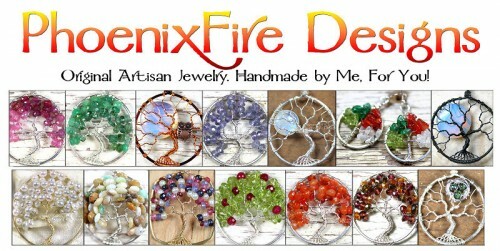 (In fact, I’m a self-employed jewelry designer at the moment.) The picture is very much real. I know, because I hand wrote it, stood in my bathroom and took the shot with the self-timer on my point-and-shoot Canon. 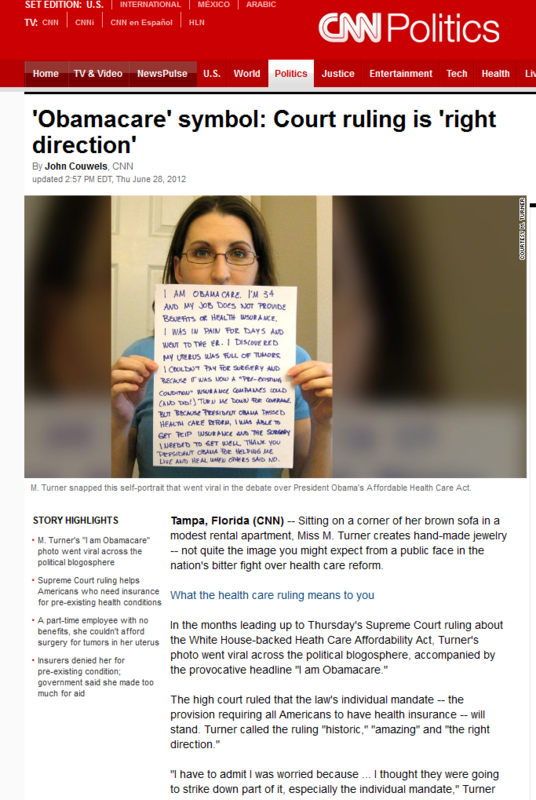 Here is when it hit CNN.com and I blogged about being on the main page of their website. Obamacare doesn’t go into effect until 2014 so you’re lying! It’s actually a timeline. Provisions have been going in effect since 2010. Some are in effect now; all will be in effect by 2014. On July 1, 2010 PCIP went into existence.. I don’t want to pay for your medical care! / It’s a handout! / You got free health care! No, I got insurance. It’s called Pre-existing Condition Insurance Plan (known as “PCIP”) is a high-risk medical insurance pool no different from the major medical coverage you get through an employer. The difference is that it doesn’t discriminate against people who already have a medical condition. Rates vary by state and by age. Some states run their own programs while others are run on a national level through the department of Health and Human Services. PCIP varies depending on your current state of residence. GEHA is administering PCIP benefits in more than 20 states for HHS, while other states will run their own Pre-Existing Condition Insurance Plan. In Florida, my coverage at age 34 was $237/month with a $1,000 in network deductible I had to meet and a 20% co-pay for all services. IT IS NOT FREE. As of September 2012, I still have about $4,000 in bills I’m struggling to pay off both from my initial ER visit and my surgery. I’ve already paid off about $5,000 in bills and we raised about another $5,000 that I needed up front just to get the surgery in the first place. It’s been extremely hard and worrying about money, bills and my future (credit rating, ability to buy a house someday, etc.) on top of being seriously ill and requiring major surgery is the hardest thing I’ve ever gone through. I’ve been working hard at my own small business to help pay my bills and pay off my medical debt. You could have just gotten Medicaid/help from the state/etc.! Hospitals are required by law to treat you so she could have had surgery for free! But there’s no guarantee a hospital will provide some level of treatment, even if a person is really sick, says George Washington University health policy professor Sara Rosenbaum. Rosenbaum says whether a patient actually gets treatment can be a matter of lucky timing and whether they show up at the emergency room just as the medical concern has blossomed into a true emergency. She said that even when a person receives some care, there often is a big gap between stabilizing a patient’s condition and providing them with treatment. Not all medical problems are covered by EMTALA, meaning that a person cannot assume that if they are ill, they will be treated. Specifically, EMTALA does not cover non-emergency situations. The hospital is allowed to determine that there is no emergency, using their normal screening procedure, and then refuse EMTALA treatment. It was literally impossible to pay for the surgery out of pocket. Just my “23-hour stay” at the hospital cost $40,000. That does not include the surgeon, the surgery assistant, the anesthesiologist, the radiologist or any other provider of my surgery. She probably drives a fancy car/has an iPhone/spends money on manicures/has a huge house/etc. instead of paying for insurance! Sadly, this kind of hateful attitude is so prevalent. Besides the fact it detracts from the big, serious issue of healthcare in America, it’s needlessly judgmental and hostile simply for the sake of attacking and judging someone. While it’s fiscally obvious people shouldn’t spend thousands of dollars on material goods instead of responsibility paying one’s bills, this kind of statement doesn’t actually address the realities or the scope of the problems in this country. Healthcare is too expensive for tens of millions of Americans to afford. Period, end of story. For the record, I drive a 1999 Pontiac Grand Am, have never owned an iPhone of any kind, use a cheap no-contract/monthly cell phone plan, live in the same apartment for the past 8 years because I can’t afford to buy a home, and have never had my nails done in my life. Not that any of that actually matters in the slightest. She should have just gotten a job that gave health insurance! So much easier said then done, isn’t that though? Honestly, what a stupid statement. If you had a choice, wouldn’t you prefer one that gave you paid vacation, paid sick time, health insurance and other benefits? Um, duh. But not every job provides that. And the same people so quick to talk about unemployment rates in one breath, tell you to find a better job in the other. It’s hypocritical and again, puts the blame on the uninsured rather than on the broken system itself. Look, healthcare is a HUGE issue in this country. It continues to be something that needs work. But solving these problems means taking steps forward. Does the Affordable Healthcare Act solve all of them at once? No. But it’s a first step. So to fight against progress, to fight against change and improvement for the consumer, is just counterproductive to your own self-interest. Don’t let the people that make and hold the money feed you their lies. Don’t swallow those falsehoods so readily. Stand up for your neighbor, your daughter, your brother, your friend. Demand that ALL Americans have access to the same level of care that the privileged few enjoy. No one should have to make these hard choices of whether to pay rent or health insurance; whether to put gas in the car or buy a prescription. When did we become such a selfish nation? When did I’ve got mine so screw you! become our national rally cry? That’s not who we are. We’re better then that. And if we’re not now, we once used to be and should be again. Compassion costs nothing. Kindness is free. So stop hating on people who are simply trying to live their lives. It’s not an attack on yours. Stop siding with big insurance against people who simply want the same option and the same access to medical care as you have. We should be supporting each other, not tearing each other down. Remember what this country was founded on – United We Stand. I just wanted to say that I thoroughly respect you for standing up for the ACA! I know that it’s been very controversial in the USA, but the debate confounds me. As far as I’m concerned, good health is a fundamental human right! Any stand against that strikes me as fascist, and unreasonable. I saw your photo on Facebook, and some of the comments on there make me sick! You’re obviously an intelligent, courageous woman, and you should be applauded for the message you’re passing on! I hope this message finds you well, and I look forward to seeing what President Obama can do with another four years! Thank you for taking the time to leave such a nice comment. I too fail to understand why better access to healthcare is a bad thing. I just don’t know when Americans became so sickeningly selfish. It makes me very sad for this country.